Kolibri brushes are handmade in Germany by Feurer & Sohn, one of the oldest brush manufacturers in Germany (established 1898). They are made by dedicated brush makers, using the highest quality hair obtained in Russia. 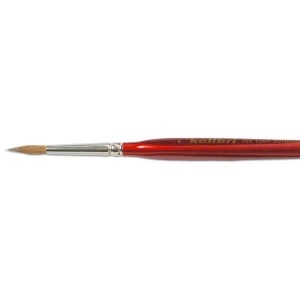 Kolibri Red Sable Detail brushes are designed for painting the sharpest details with fluid paint. They are made from the tail hair of the weasel (Mustela nivalis) found in northern China. 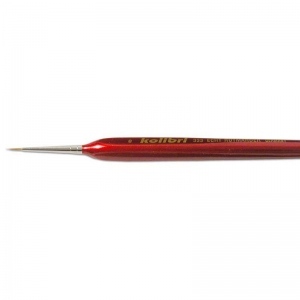 The ferrule of each Kolibri Red Sable Detail brush receives two deep crimps. Deep crimping compresses the walls of the ferrule into the wooden handle, creating a mechanical lock that securely fastens the ferrule to the handle. The short red polished handles are made of hardwood and are lacquer finished for long life. Only the best brush handles are dipped. They are made by lowering the handles first in primer, then twice in colored lacquer and finally in varnish -- a total of four coats -- for a lustrous durable finish. For ease of handling in a pencil grip, the hardwood handles are 14 cm (5.5 in.) from the ferrule to handle end. The handle's triangular shape provides a comfortable grip that is secure while working to allow you to make the finest details. The triangular shape also prevents the brush from rolling off tables and work surfaces. When you see the term "sable" it is not really from sable at all, but comes from the tail of a species that is a member of the weasel family (Mustela) found in many areas of the world. The sable (Martes zibellina) is a species of marten. Originally, the name "weasel" was applied to one species of the genus, the European Least Weasel (Mustela nivalis). In technical discourse, the term "weasel" can refer to any member of the genus, or to the genus as a whole. Of the 16 extant species currently classified in the genus Mustela, ten have "weasel" in their common name. Among those that do not are the stoat or ermine, the two species of mink, and the polecats or ferrets. Weasel hair is generally conceded to be the second best hair for oil and watercolor painting brushes due to its strength, spring and ability to retain its shape. The finest hair is Kolinksy sable, which comes from another species of weasel found in Siberia. Only weasel tail hair from northern Asia is long and fine enough to be suitable for brush making. The hair can be distinguished by their reddish brown color whereas Kolinsky is golden brown and longer than weasel hair. Our sable brushes are made from weasels found in northern China and hold a very fine point or edge, is a professional grade of hair, and, if properly cared for, will last for many years. 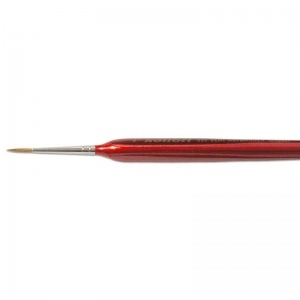 Other manufacturers may make their brushes from a mixture of weasel and ox hair, commonly used to manufacture most medium and low-priced red sable brushes.